A Tax Compliance Certificate (TCC) is necessary when doing business with the Government of The Bahamas and has been in effect since July 1, 2015. The Financial Administration and Audit (Amendment) Act 2015 part IIB lays out the legal basis for the provision of the TCC. Receive allowances under the provisions of legislation (i.e. churches, schools, etc). The certificate will be valid for a period of six (6) months as of July 1st, 2018. NB: The public should be aware that a Tax Compliance Certificate will not limit the execution of audits and will not rule out taxes that are owed to the Government. 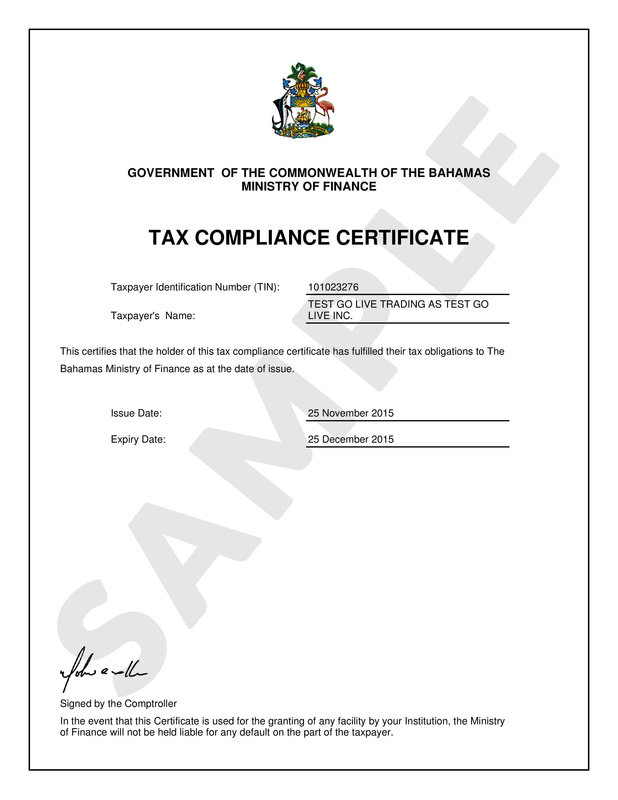 This is just a sample copy of how the tax compliance certificate will look.